Lloyd SB - 8ths, 16ths / Princess Anna. Vinyl 12. Bleep. Out there neo-grime, deconstructed trance and erratic rhythms from the mysterious Lloyd SB. 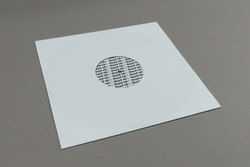 Taking cue from the famous banking organisation, SB crafts strange and hyper-contemporary computer music which entertain a melting pot of influences such as UK funky, golden era IDM and the grime/trance hybrid which seems to be on point at the minute. On this two track twelve the producer showcases new pieces ‘8ths, 16ths’ and ‘Princess Anna’. The former seems like an invitation for adventurous rappers to step forth, whilst the second makes us think of some warped homage to genre pioneer Ruff Sqwad’s ‘Anna’.